Blog Quick Quotes: Card Inspiration with Louise! Good morning Quick Quotes readers, I hope you are all having a great summer! Louise here with a quick summer themed card that I made using the Anchors Aweigh and Navigator collections. 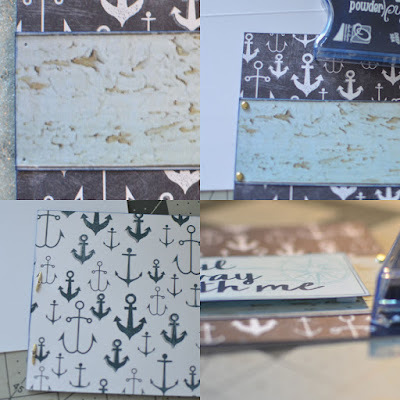 I used the Anchors Aweigh 108 paper for the background and added a horizontal stripe from the Navigator 102 paper. I like the look of brads with these nautical themed papers but didn't want the backs of the brads poking the recipient inside the card. I solved this problem by attaching these 2 papers with the brads before adhering them to the card base. The blue circle with the Anchor is from the Navigator 12" x 12" Quotes and Phrases sheet. The larger sentiment, which is from the Navigator Quotes and Phrases strip, is adhered with raised foam to give the card more dimension. The edges of all of the papers and sentiments are inked with PowderPuff Chalk Ink in Deep Sea.